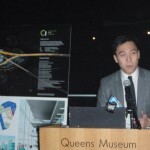 Jukay Hsu spoke at the Queens Museum of Art above the Panorama of NYC. 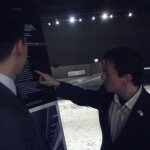 Many elected officials and community leaders were there to show support for the project. 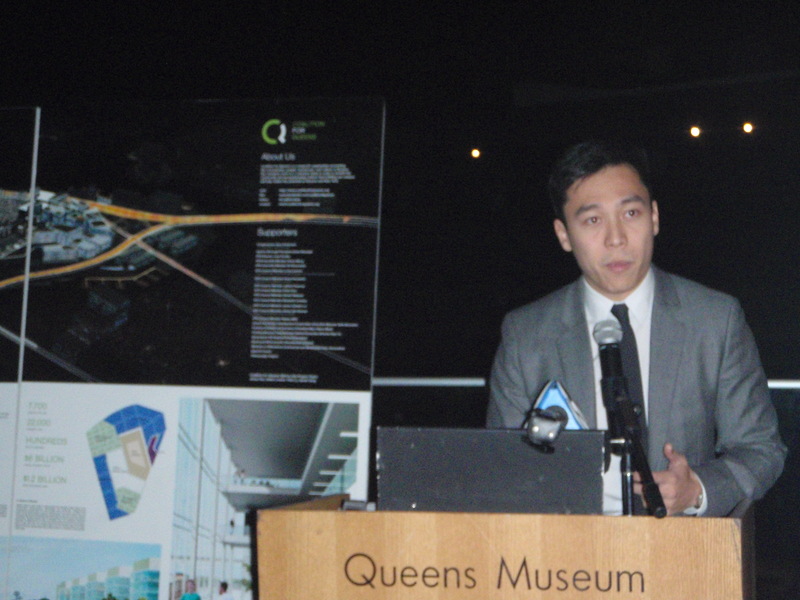 In Queens, we have the chance to create our own Silicon Valley. This is the story of how it may come to be. You’ve heard of Silicon Valley. It’s the birthplace of Hewlett Packard, Eastman Kodak, General Electric and many other household names. Facebook and Google are here too. But it wasn’t always a technological boom town. Silicon Valley used to be a farm, the underutilized sort. I think they grew carrots. Some of the greatest companies in the world got their start at a farm owned by the Stanford family. In a stroke of genius, Fred suggested to a cash-strapped Stanford University, who owned the farm, to lease space exclusively to new technology companies. He gave a wink and a nod and he called it his secret weapon. Stanford Industrial Park was born. Why did these companies decide to locate to Silicon Valley? They had a little help from Fred Turner, also known as the Father of Silicon Valley, to welcome them with open arms, cheap rent and ample space. Enticed by the prospect of cheap rent and room for growth, a massive technological migration took hold across America. Their destination was Silicon Valley, California. Tech companies wanted to work side-by-side with other tech companies to form a community, a digital hub for creativity and enlightenment. Silicon Valley became a reality and it changed the world. The technology sector now had a home, an inspiration base of operations thanks to the foresight of Fred Turner. In Queens, there is a chance to have a technological epicenter just like Silicon Valley at our doorstep right here in our borough. 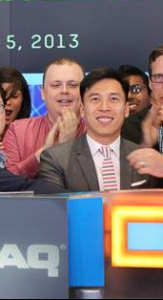 Jukay Hsu and Emil Skandul are the Fred Turners of the East Coast. They have a plan to bring Queens into the next century. 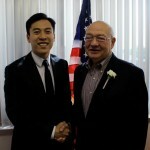 The first time I met Jukay Hsu was at the Clinton Democratic Club where Jukay pitched the idea. 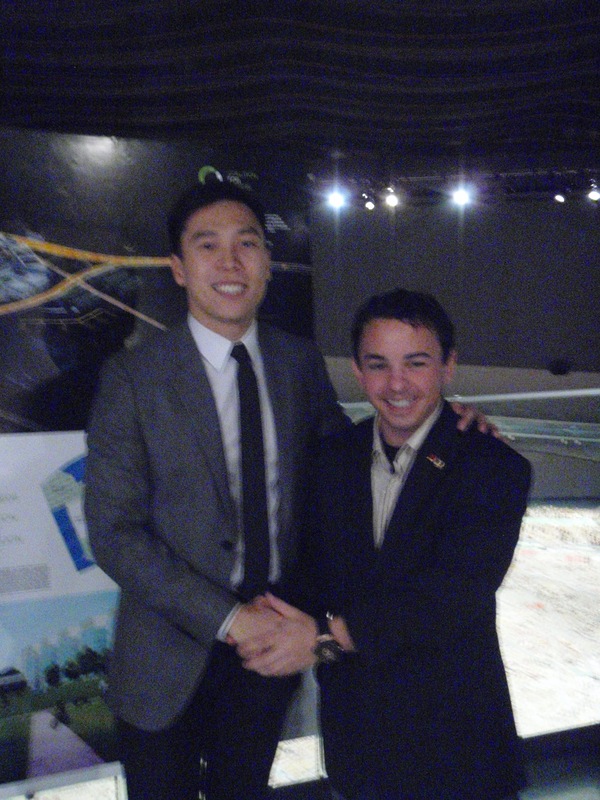 He was very knowledgeable and well spoken. He mentioned jobs. Everyone’s ears perked up. “Incoming college students would provide an influx of capital and a new market population, allowing local small businesses to thrive,” said Jukay. Jukay identified two locations, Willets Point and Roosevelt Island. He was looking at the big picture. 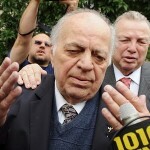 He was talking about the future of the borough, and his rally call was, Why not Queens? I’m more familiar with Willets Point, so let’s talk about the EDC plans here first. 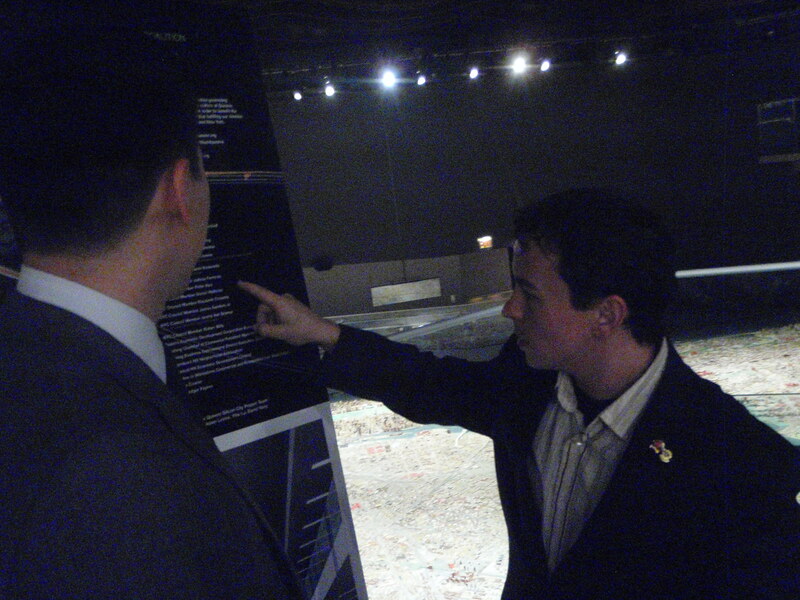 Jukay Hsu of Coalition for Queens shows me the list of supporters for a tech campus in Queens. I grew up in Flushing, a stone’s throw from the possible project site. Perhaps you’ve heard of the Iron Triangle? Maybe you’ve been to a Mets Game at Shea Stadium Citi Field. If the parking lot is filled, or you want to save $20 bucks, chances are you’ve parked somewhere in Willets Point. The area, adjacent to the Flushing River, looks like a wasteland. Your eyes will begin to tear as the fetid stench from Flushing Bay hits you like a big rig. You glance down and realize your standing in a pothole that could swallow a car tire. Is this a dump? Where am I? The Point, or the Iron Triangle as it has been nicknamed is a blighted area that has long defied any development since the days of Robert Moses. It was one of the City’s last bastions of skilled and semi-skilled labor. Automotive mechanics, warehouse workers, spice and glass manufacturers employed many people, local people, friends of mine. Even though they don’t have paved roads, or garbage collection, or any infrastructure whatsoever, beyond its ugly frontier appeal was a community. Maybe not in the traditional sense of the word, but the kind that took care of one another. During winter storms, they plowed their own streets. Things have changed. Because of eminent domain, these longstanding businesses will have to vacate the premises, or they already have. The community protested, even challenging it in federal court, but they lost. In the past few years only 10% remain after the EDC’s land acquisition. The automotive jobs and manufacturing jobs were slowly siphoned off to make way for the next great neighborhood. What’s a great neighborhood without a great college in walking distance? My mom used to say the shop owners purposefully left debris in the road to give you a flat, then you’d have to buy their tire, right in front of the place where it happened. It was an area to be avoided at all times. The City’s Economic Development Corporation has a plan for the area to include a hotel and convention center, parkland, retail and residential space. The EDC has a three-phase plan for Willets Point that focuses on the construction of housing and park space. So, why not include a college campus? When land acquisition began and the EDC bragged about job creation it raised some eyebrows. Somehow, I don’t see a master iron worker as a bellhop. More than likely that ironworker or car mechanic has left for greener pastures, much of the work has dried up. Many businesses remain in place – even after they cut a deal. So is it enough to justify the loss of one of the greatest projects Queens could ever see? 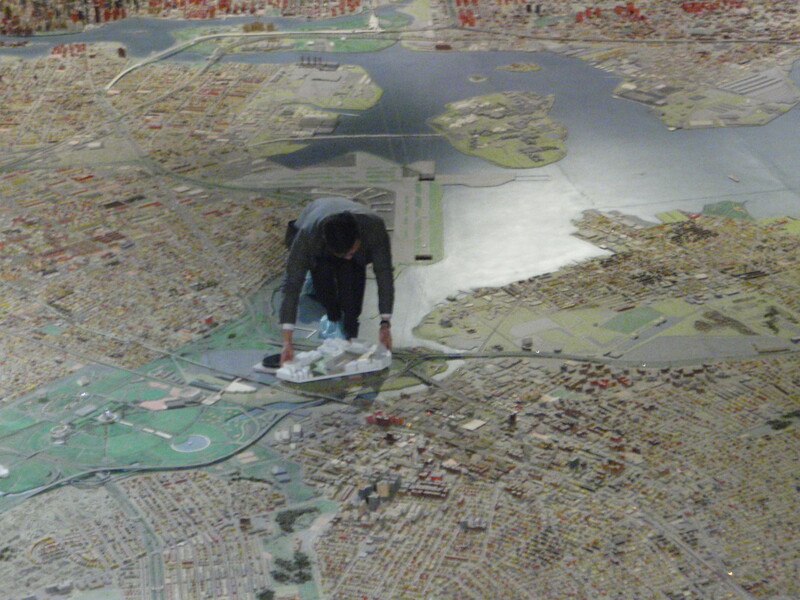 At the event held at the Queens Museum of Art, Jukay had the honor of placing a scale model on the Panorama of New York City. It was symbolic. It said this project is moving forward. I began to imagine a bustling techno-hub where local residents and college students would be the first for new jobs. Then I thought how well the area is served by public transportation. Maybe the 7 Line isn’t glorious, but you can exit and walk right into Citi Field, or right into a classroom. Could it really happen in my backyard, in Willets Point? 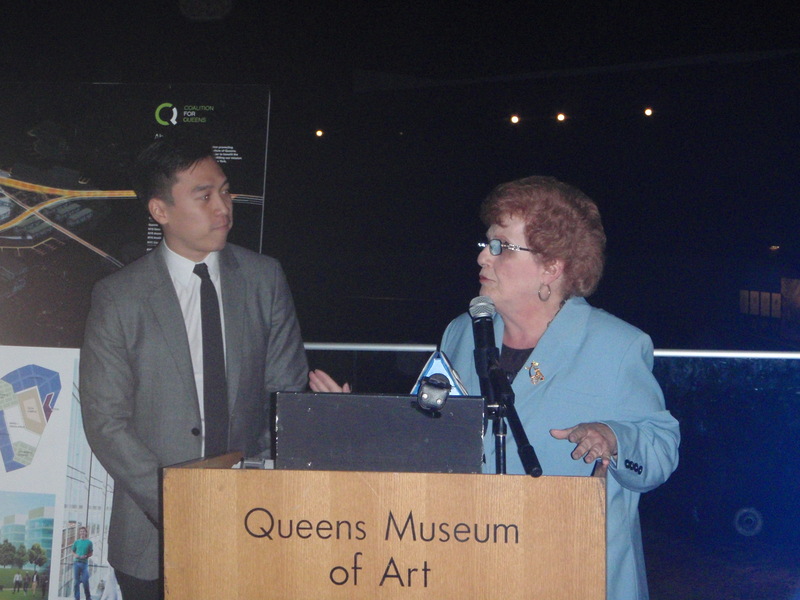 If Silicon Valley 2.0 is successful, than the education and biotech sectors will come to Queens. I’m advocating that it comes to Willets Point, even if the Daily News thinks it’s a pipedream. Now we’re talking thousands of jobs and limitless possibilities. Where would the world be without big thinkers? That being said, my primary concern was how much support the Silicon Valley 2.0 project is getting from elected officials, you know, aside from the political grandstanding. As it turns out, many elected officials are in full support of a Queens based location and have been holding the EDC’s feet to the fire. 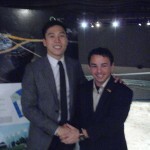 Queens-Politics supports Coalition For Queens. This is a City issue, so Karen’s advocacy is a critical component to move the project forward. 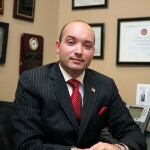 The Queens Delegation, headed by City Council Member and Deputy Majority Leader Leroy Comrie (D-27) is in the process of sending a letter to Speaker Christie Quinn and Mayor Bloomberg to consider Queens for the Applied Science Initiative, a project where Mayor Bloomberg pledged one hundred million dollars for a science and engineering school somewhere in New York City. 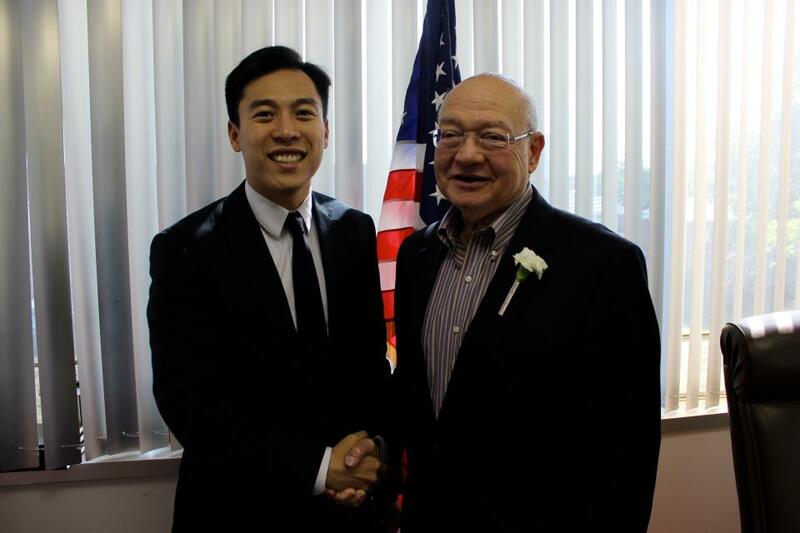 Support from civic leaders is not in short supply, Flushing Chamber of Commerce’s President Myra Herce Baird, and Paul Vallone, a member of CB 7 and President of the Clinton Democratic Club enthusiastically endorsed the group’s objective. But not everyone is welcoming the project. State Senator Tony Avella staged a protest with concerned business owners in 2009, and Queens residents like Christina Wilkinson, who spoke with me in a Facebook post, expressed strong doubts about the City’s ability to pay for the project citing environmental remediation as too costly and requiring another ULURP decision. The college CAN’T be included as per what the council passed, is my point. And that’s why the City keeps rejecting the idea. There would have to be another ULURP action and votes by the Community Board, Borough President and the City Council in order for the City to allow a university to be sited there. It’s not just a little amendment that would have to be passed. Considering the fact that most council members I have spoken with don’t even understand ULURP, even though they vote on them weekly, I doubt they are going to be able to get the Mayor and Speaker to push a new vote through. This whole movement is a joke. And what university is going to pay to raise the land above sea level and to remediate the property in order to site a campus there? 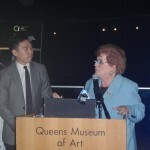 Jukay Hsu stands with City Council Speaker Karen Koslowitz in solidarity for Coalition for Queens. 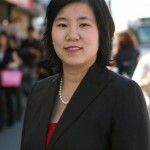 The Coalition is asking for a campus to be specifically located in either Willets Point, or Roosevelt – part of what Jukay Hsu calls a ‘tech corridor.’ While representatives of both Stanford and Cornell said yesterday they prefer Roosevelt Island for a satellite campus, a decision has not been made yet. Other sites have also been suggested such as Creedmore. I doubt they’ve ever been to Willets Point, it sounds just a little premature. Could the potential of the site be overlooked? Yes it can. It is doubtful if they could point to Willets Point on a map, I mean it’s only next to the old World’s Fair grounds, but I digress. According to the Mayor’s press release, the only Queens location under consideration – to either build or expand an engineering or applied science campus is Roosevelt Island. Yes, Roosevelt Island is considered Manhattan. We’re separated by the East River. The island is tiny. There’s not much room for growth, which means tech hopefuls will have too look at Manhattan where space is at a premium and rent is through the roof. No businesses can afford to startup here, the rent is too damn high. New business startups would have to be sacrificed, there’s just no room for them on Roosevelt Island. “Startups need cheap rent,” said Emil citing that Apple and Google were started in a garage. To locate in the Five Boroughs you need cheap rent. “We want an ‘industry cluster’ in Willets Point or Roosevelt, and that’s what makes Silicon Valley, a silicon valley,” said Emil who specializes in economic development. Unlike Willets Point, Roosevelt Island lacks the infrastructure for the project. They’d have to remove the Goldwater Hospital first, an expensive undertaking. The 100 million in allocated funds won’t pay for this, not even close. A hundred million will not buy another bridge or tunnel and it won’t provide you with ferry service. The Roosevelt Island Bridge is in the most off the grid location, most people don’t know how to get to it. It’s not convenient. We’ll need a new bridge. Seth Bornstein of The Queens Economic Development Corporation (not to be confused with the EDC) said if Willets Point is not chosen, Queens will still benefit from the project in the long run if Roosevelt Island is the pick. Of course Seth! I believe that if it’s Willets Point, the economic ripple will expand in concentric rings that will emanate from the center of the borough, rather than at it’s western most point at Roosevelt Island. I felt it was a fair point to make. Obviously Willets Point is the better choice, but Roosevelt Island will do. “Manhattan and Brooklyn get all of the attention,” he booed, “Queens is a great place and we support the project, in any Queens location,” said Bornstein. Mayor Bloomberg said that New York City became the country’s economic engine because our entrepreneurs were the most innovative — and their ideas and investments built our city into a global powerhouse. So why not give them the chance to become our economic engine with a site in Queens that makes sense? Is Willets Point the better location? Yes, for obvious reasons. But Roosevelt Island is still more beneficial to Queens than the Brooklyn Navy yards, or Governors Island, two of the other sites under consideration by the EDC. As concerned residents we must urge all of our elected officials to support the inclusion of a Silicon Valley 2.0 in the redevelopment of Willets Point, and if that’s just too much to ask, let’s settle for Roosevelt Island. We have to look to the future. We need to think outside the box. If you would like to speak to the Coalition, or have them speak at your meeting, I encourage you to to learn more by visiting their website and their Facebook page. You can also find an online petition where you can show your support. Or just Email Emil Or Jukay directly, they will be happy to hear from you.